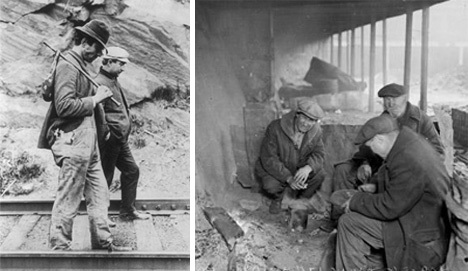 Hobos have played a big part in the history of America – one that’s often ignored. They were the nomadic workers who roamed the country at the start of the 20th century and through the Great Depression, taking work wherever they could and never spending too long in any one place. In their extensive travels, hobos learned to leave notes for each other, giving information on the best places to camp or find a meal, or dangers that lay ahead. This unique Hobo Code was known to the brotherhood of freight train riders and used by all to keep the community of traveling workers safe, fed and in work. First, a bit of history. Today, the word hobo is often used interchangeably with “bum” or “drifter,” but hobos were a very specific type of homeless traveler. Hobos traveled around for the sole purpose of finding work in every new town they visited, having usually been forced from their homes by the lack of jobs there. Bums avoided work in favor of drinking heavily, and “tramps” worked only when it was absolutely necessary. Because of their willingness to take the jobs that no one else wanted – and the fact that they followed a strict moral code – hobos were tolerated by some. Regardless, life as a hobo was difficult and dangerous. To help each other out, these vagabonds developed their own secret language to direct other hobos to food, water, or work – or away from dangerous situations. The Hobo Code helped add a small element of safety when traveling to new places. 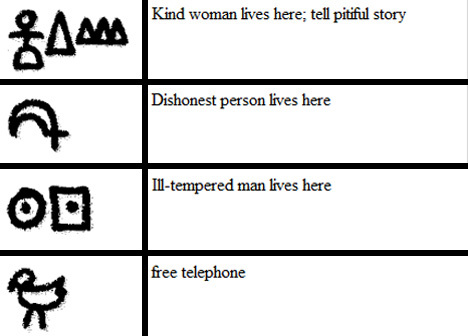 The pictographic Hobo Code is a fascinating system of symbols understood among the hobo community. Because hobos weren’t typically welcomed (and were often illiterate), messages left for others in the community had to be easy for hobos to read but look like little more than random markings to everyone else to maintain an element of secrecy. The code features certain elements that appear in more than one symbol, such as the circles and arrows that made up the directional symbols. Hash marks or crossed lines usually meant danger in some form. Many of the hoboglyphics were cryptic and nearly impossible for people outside of the hobo community to understand, even if they spotted them: a curly line inside a circle, for example, meant that there was a courthouse nearby. 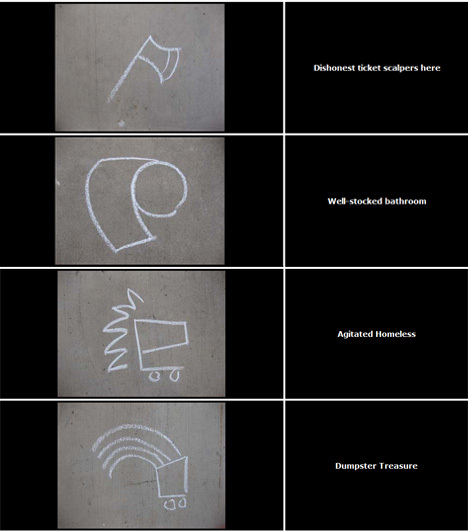 Other symbols were simplistic and easier to decipher: a cross meant that hobos who were willing to talk positively about religion would score a free meal. 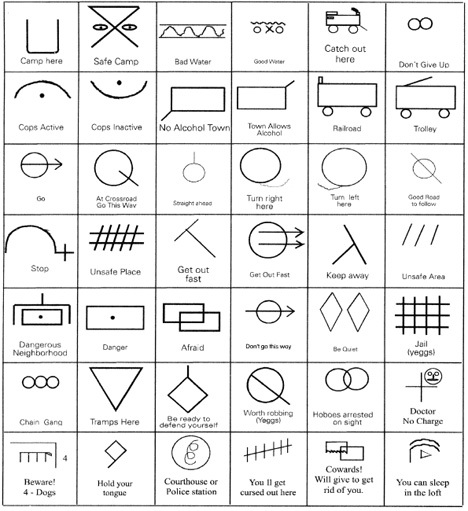 The diverse symbols in the Hobo Code could be found scrawled in coal or chalk all across the country, near railyards and in other places where hobos were likely to convene. The purpose of the code was not only to help other hobos find what they needed, but to keep the entire lifestyle possible for everyone. Hobos warned each other when authorities were cracking down on vagrants or when a particular town had had its fill of beggars; such helpful messages told other hobos to lie low and avoid causing trouble until their kind was no longer quite so unwelcome in those parts. Over the years, the hobo subculture has declined dramatically. One reason for this is that the hobo community was so intricately connected with the American railway. 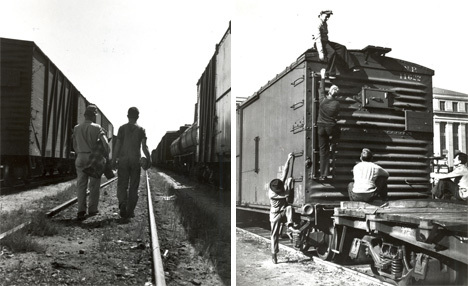 It’s much more difficult to hop on and off of a freight train undetected than it was a hundred years ago, so rail-loving hobos have steadily declined in number. Still, current estimates put around 20,000 people in the U.S. living the hobo lifestyle today. It’s easy to see why there’s not much specific data available about these wandering workers, but some sources suggest that the modern hobo movement is the result of a generation’s shunning of modern trappings. Much like city hipsters, modern hobos embrace fringe society…although living in train cars with no permanent home or job is taking that fringe society fetish much further than most hipsters ever dream of. The story of one group of modern American hobos is told in this remarkable photo essay (LINK NSFW). 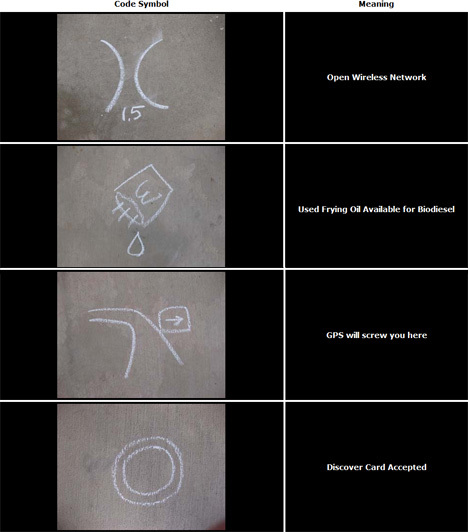 Modern hobos may not use the complex set of codes that proved so useful for 19th century wanderers, but the always-hilarious Rob Cockerham of Cockeyed.com has come up with a modern set of symbols that might be useful for anyone who needs some covert information. These codes are clearly tongue-in-cheek, warning modern-day hobos (and everyone else) of such dangers as parking tickets and lawn sprinklers, and promising surprises like rich dumpsters and well-stocked bathrooms. Since not many of us ride the rails these days and it’s much more common to be stuck in the urban (or suburban) jungle, maybe this is just the type of friendly information sharing we need today.